Young salmon are instinctively ingrained to avoid docks. By doing so, they venture out into deeper water and often end up in the bellies of cutthroat trout and other denizens of the deep. With 2,700+ docks and marinas along Lake Washington alone, you can imagine what a challenge they pose to young salmon trying to make their way out to sea. Circumnavigating all these docks not only puts salmon in harm's way, but it adds a considerable distance to their outbound journey. Fortunately, salmon friendly dock design alternatives are now available for lakeshore landowners. Grated decking allows light to pass through. Lack skirts or side boards that extend down to the water. Dock bottom is 18" above ordinary high water. Overhead lights are not left on at night. Light permeable docks have narrower ramps and a grated deck. These features all result in a dappled light pattern similar to being under shoreline vegetation. The grated deck is non-skid – and splinter-free. Homeowners like its low maintenance and durability. When it's time for periodic maintenance, existing docks can be made more salmon-friendly by replacing some of the decking with surface grating. The most critical area for juvenile salmon is the first 30 feet from the edge of the shoreline. 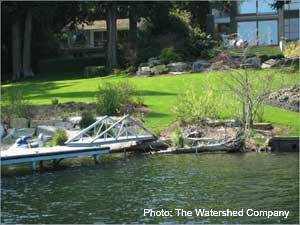 Docks can be built more like a "bridge" to span this area with few or no pilings. 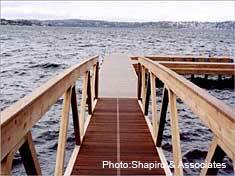 Salmon-friendly dock designs can be architecturally graceful. 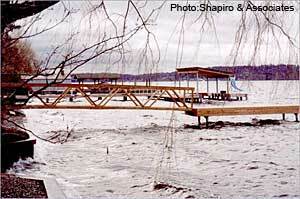 The use of glue-laminated beams and steel pilings enables a span of 20 feet between pilings. Why do Chinook Salmon Need Green Shorelines?